Bruce Schneier is an internationally renowned security technologist, called a “security guru” by The Economist. He is the author of 12 books – including his latest best-seller Liars and Outliers: Enabling the Trust Society Needs to Survive – as well as hundreds of articles and essays, and many more academic papers. 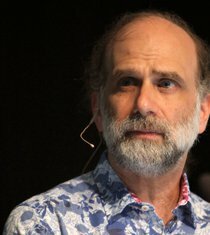 His influential newsletter “Crypto-Gram,” and his blog “Schneier on Security,” are read by over 250,000 people. He has testified before Congress, is a frequent guest on television and radio, served on several government technical committees, and is regularly quoted in the press.